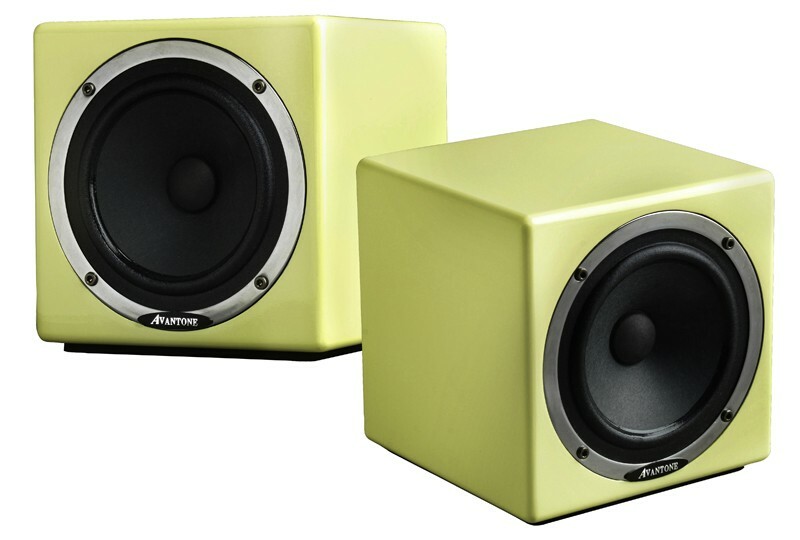 The MixCubes are reference monitors meant to accurately and transparently represent what your music will sound like through a bass-challenged playback system such as an iPod docking station or TV or computer speaker system. Studios primarily use 2-way & 3-way larger monitors designed to represent a wide range reference viewpoint at higher listening levels. However, in this newly developing age of High Definition Audio, there is still a need to also hear what your mix will sound like when played back over small “bass-challenged” systems such as televisions, clock radios, computers, car stereos, iPod docking stations, etc. It is important to make mixing judgments based partially on listening to reference monitors that will not impart tonal anomalies caused by crossovers or inferior full range drivers. Particular attention is always paid to the critical mid-range vocal/guitar/keyboard areas. This is where having a full-range monitor without a crossover is truly revealing. Ten months of R&D comparative listening & tweaking went into the voicing of the AVANTONE MixCubes. The result is a very smooth sounding, full range upgrade from the original 5C Sound Cubes. Listening tests reveal that the MixCubes have a smooth, more open, transparent top end response with extended bass while maintaining their basic original character. Of course you should have a 2.1 (Left, Right and Sub) or even 5.1 (Front Left, Front Right, Center, Surround Left, Surround Right, and Sub) system as your main playback system, but this only gives you part of the picture. The MixCubes fill in the other end, and arguably more important end - what will your music be played on more frequently, a club system or a more consumer-level system like a radio, computer, or iPod? - of the spectrum. Avant Electronics designed the amp module from the ground up to be a true professional-grade amplifier. It incorporates "overkill" concepts in component selection as well as safety. The result is a "no-compromise" amp with robust headroom characteristics that will rival the performance of much higher priced studio rack mount amps. BALANCED INPUT: This "combo XLR" input accepts a BALANCED male XLR plug as well as a 3-conductor BALANCED TRS 1/4” or a 2 conductor UNBALANCED TS 1/4" male plug. For unbalanced operation with a TS connector the minus signal is automatically grounded. SYSTEM GAIN: This variable control adjusts the sensitivity of the signal that appears at the input. Rotating the control clockwise increases the sensitivity while a counter-clockwise rotation decreases sensitivity. The adjustable gain range is from -30 to +6 dB. A setting of +6 allows a full, unimpeded signal to be sent to the amplifier. The detented gain positions allow for repeatable settings between speakers for proper matching. Please Note... when the signal appearing at the input is too hot, the amplifier can overload causing distortion and possible damage to the speaker. If overload occurs, attenuate (decrease) the input level by turning the knob counter-clockwise a few clicks. ON/OFF Switch: This illuminated switch turns the amplifier section on and off. The unit is still receiving power from the transformer however. AC INPUT: This input is only to be use with the proprietary AVANTONE Power Supply. Tighten the cable/connector securely for reliable operation. Note: There is a switch on the power supply for selecting the proper AC/MAINS operating voltage for your location. GROUND LIFT Switch: By engaging this switch the pin 1 shield is lifted at the input jack. This can be used to aid in ground loop control of the incoming analog line signal. Be sure to check out the PreSonus Monitor Station for a great desktop monitor control system - use it to switch from one playback system to another for instant comparison. Avantone design each of their microphones to fill a certain niche or perform a certain purpose, so lots of thought and intent goes into each of their models - they aren’t just copying other companies or building run-of-the-mill models. Avant Electronics is a family run business who’s motto is “affordable excellence”. They are passionate musicians who are also business people, although they refer to their company as a family more often than as a business. The people at Avant have decades of experience in the music business so they know good gear and good sound, and they also know that with great designs, forward-thinking innovation, and careful quality control, great gear doesn’t have to wipe out your bank account. Every Avantone product comes with a 5 year warranty and everything is carefully checked and tested in the USA - it takes them some extra time but it’s all part of their commitment to excellence (and we suspect they enjoy it maybe just a little bit too).